I love the idea of making, inventing and tinkering. Just watch kids who are immersed in the activities and you can see the engagement. 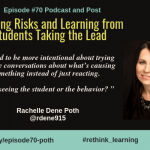 But is the learning authentic and relevant? I presented three sessions at the Free Maker Movement event at One Work Place on Wednesday, September 30, 2015 with some amazing educators who presented hands-on activities. The event will took place at our Oakland Center for Active Learning . I decided I needed to spend some time researching where the Maker Movement was happening and find examples of authentic learning. 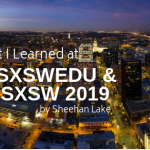 This gave me the opportunity to talk to several of my friends and share how they have transformed learning spaces to Makerspaces. Everyone I talked to made a point that it is about creativity not consumption. Yet when I went to different Maker events, I saw activities that an adult set up, purchased a kit or provided directions for activities. They were all fun, but I was having trouble seeing the connections to real learning or any ownership from kids. I read Jackie Gerstein‘s post: MAKE STEAM: Giving Maker Education Some Context where she wrote “recent discussions with other educators and administrators made me realize that the idea of maker education is often vague and seems unrealistic in terms of regular classroom instruction.” She shared her thoughts of Maker Education in the context of STEAM (Science, Technology, Engineering, Arts, Math) where teachers integrate maker projects into their classrooms. 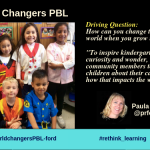 Read her blog and check out the Thinglink by clicking on the dots for more information. Shannon emphasizes the power of story where learners can play with content, media, narratives, remix, mashup and then tell their story. She encourages her learners to connect to the story in different ways: Skype with authors, create their own stories, and publish eBooks. One learner loved the “I Spy” books and wanted to Skype with the author “Jean Marzollo so Shannon set it up. 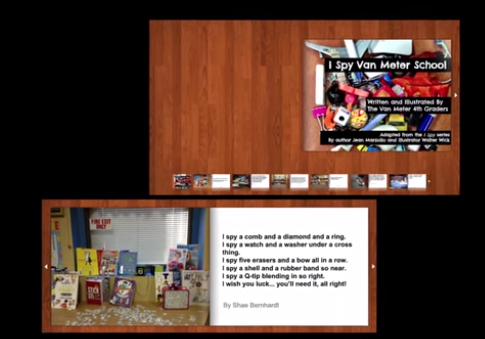 What came out of the Skype was for learners to create their own “I Spy” book for Van Meter School. Shannon redesigned the library to move to creative, innovative spaces: Makerspaces around the concept of stories. Learners took their iPads and used an Augmented Reality program, Layar, to add multimedia to texts, posters, and books. She found different apps and organized them in a Digital Makerspace using Symbaloo. After pulling together different Makerspace activities, Shannon wanted a way to provide opportunities for making in the classroom. So she created Makerspaces Mobile bags that teachers could pick up and use in their classrooms. Laura’s goal is to create learning experiences that empower and equip students with necessary skills to effectively produce and consume content across multiple media platforms. She went from K-8 to the high school to a library that was very traditional that was under-utilized. In less than two months she transformed the library by just adding activities aligned to classroom instruction. She even used DonorsChoose to purchase a 3D printer and provides multiple suggestions to build your own makerspace. Diana Rendina, @DianaLRendina, is a Media Specialist/Librarian at Stewart Middle Magnet School in Tampa, Florida. Diana is passionate about school libraries being places for students to discover, learn, grow, create, connect and collaborate. 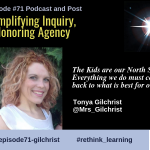 She shares her journey on her blog, Renovated Learning: Building a Culture of Creativity and Discovery in Education. 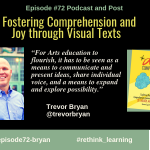 She has worked to transform her school’s library from a quiet, dusty, cluttered room into a vibrant and active learning space where students want to be. 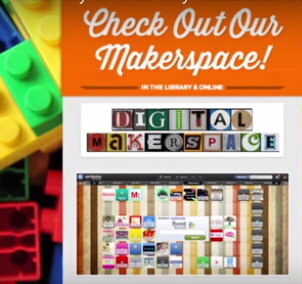 In 2014, she created a Makerspace in her library to serve as an informal STEM learning space for her students. Diana shared how their Makerspace has changed, grown and evolved since it was first conceived and started in January 2014. Follow along with the story of their journey here. Hopefully it will inspire you to start your own Maker journey. This is just the beginning and a short overview of how libraries are transforming to Makerspaces. 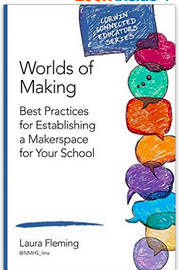 But one thing I did find from talking to Jackie, Shannon, Laura and Diana is that the librarian’s role is changing and Makerspaces can connect to learning. The Library is changing and bringing stories to life. Makerspaces can be digital and mobile. If Teachers and Librarian/Media Specialists collaborate on curriculum design, projects can be integrated in to STEAM and other curriculum activities. So this is just the beginning of my investigations how these Makerspaces can expand authentic learning activities.